Last week, eavesdropping on book club conversations, I overheard a boy admit to his group that he’d read ahead and finished the book. “It was rainy, so I stayed in my pyjamas all day and just finished it.” My heart soared. It was another rainy weekend here, perfect for reading knitting and a lot of pyjama time. I finished Catherine Reef’s biography of Mary Shelley, The Strange True Tale of Frankenstein’s Creator Mary Shelley. It is a long title for a slim volume. Publisher’s Summary: On the 200th anniversary of the publication of Frankenstein, comes a riveting biography of its author, Mary Shelley, whose life reads like a dark gothic novel, filled with scandal, death, drama, and one of the strangest love stories in literary history. Last year, one of my ESL students made my jaw drop when she gave her oral presentation on Frida Kahlo. She was a quiet, shy student and not really confident in her abilities. She’d had a little trouble getting started on her research, but when she and I sat together and went on a virtual tour of Kahlo’s Casa Azul she was inspired and her speech was one of the best I saw in the entire 4th grade. 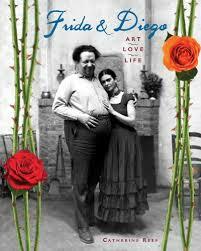 Two new books have come out about Frida Kahlo, for different audiences and reading levels. 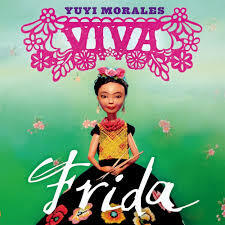 Viva Frida by Yuyi Morales brings Frida to life with puppets. The simple bilingual book celebrates Frida’s creativity and joie de vivre. It is not a biography, but a celebration. Readers will enjoy examine the details on each page. This is an excellent book to introduce Frida to kids. Older readers can learn more details about Kahlo, and her relationship with Diego Rivera in Frida & Diego: Art, Love, Life by Catherine Reef. This book portrays the passionate and complex relationship between the two in language suited to a middle school audience. Primary sources enhance the text. Paintings are reproduced at the end of the book, rather than in the context in which they are discussed. back matter includes a timeline, endnotes, bibliography and index. Hispanic Heritage Month began on September 15th and will end on October 15th.